Abandoned in the bowels of a Star Destroyer, Han Solo breaks free from his cell. Can he find his friends, navigate the mammoth ship, and escape the Imperial Forces to live another day? This is Han's adventure, and you are in control. 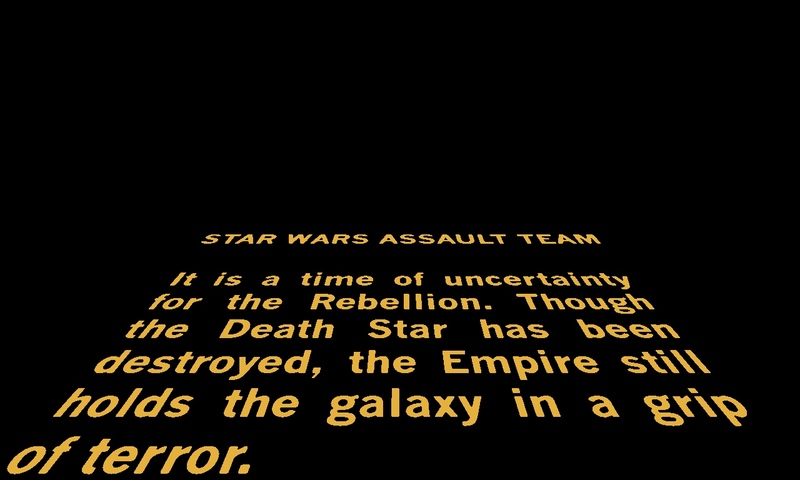 Star Wars: Assault Team certainly reads like a movie, and at some points it looks like a movie as well. Unfortunately, that movie is 'The Phantom Menace'. Star Wars: Assault Team uses the collectible card game model, with your available hero characters represented by cards, as are the power-ups, promotions, and special effects. 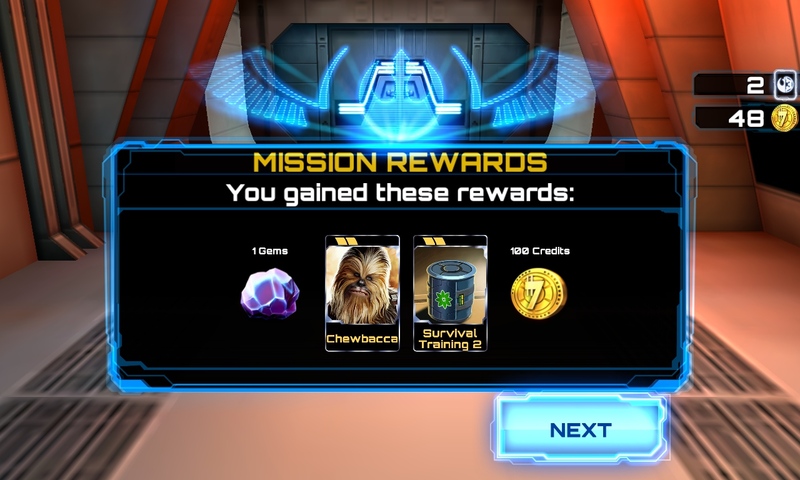 To progress in the game you need to play thorough and win various missions to earn credits. These can be used to buy more cards to upgrade your characters and improve your chances in the next game. There's no doubt that the Star Wars franchise helps the atmosphere in Assault Team immeasurably. After countless digital games, the look of a game in the Star Wars Universe is pretty much settled, so any gamer is going to feel comfortable in this environment. Unfortunately, to get the Star Wars look and feel involves lots of slow cut-scenes, cute graphical call-backs to the film series shoe-horned onto your screen. The game (what there is of it) plays at a slower pace so all the IP elements can be honoured. 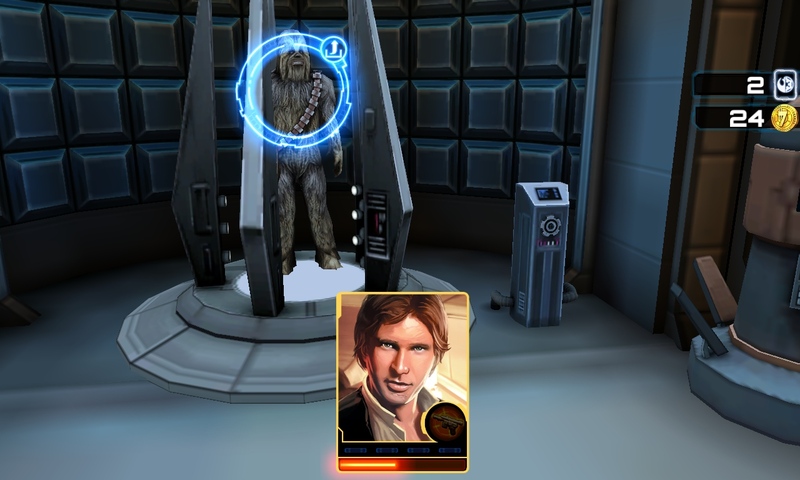 Strip away all the fancy graphics and the 'look, you be Han Solo!' and you are left with a tired card-game that has only a superficial level of strategy. Which also has a significant freemium system grafted on top of the game mechanics. It's very much a case of 'buffets'. The two opposing forces line up opposite each other, and everyone gets a turn to make one action. That could be firing a weapon or using a special power. Every 'troop member' gets one action in sequence, so if you outnumber your opponents then you can get two or three hits from your side while the enemy gets just one. Choosing who to target is certainly a tactical decision, but I'm not sure if that's enough to fairly earn the label 'tactical game'. You'll play through a series of match-ups in each mission, and after each bout you'll simply move on to the next fight (although you might be asked to press a 'door open' button to give the game a semblance of interactivity). There's no opportunity to heal between these moments, so you'll need to keep an eye on your health as you work through the storyline given to you. Again this is good and bad game design in one. You have the Star Wars trappings, but are you seriously telling me that you have an entire detention block guarded by two stormtroopers? And the two waiting for you fifty yards down the corridor will just wait, rather than join up forces? It doesn't ring true in the gaming world - the Imperial Forces win by massed attacks and volume of troops - not in one on one combat. The simplistic design and advancement of the plotline, coupled with a game mechanic that is best described as 'hit them, till they stop' does not make for something engaging that is going to keep me coming back to play again. All of this is before looking at the monetisation of the game. 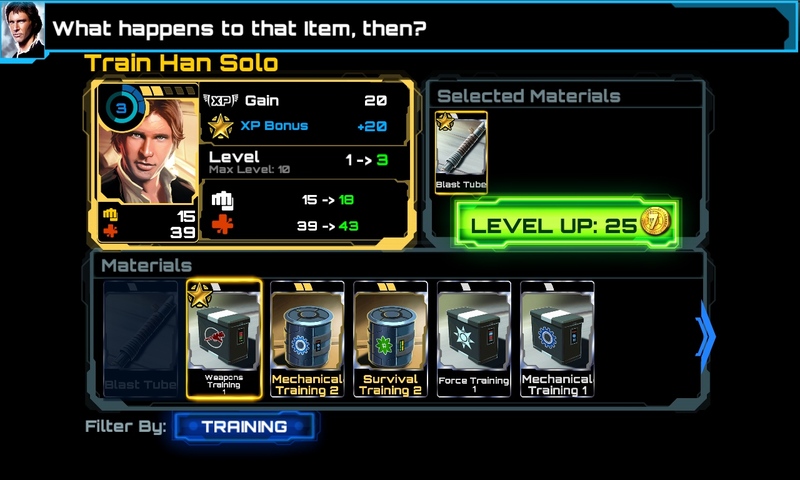 Star Wars: Assault Team is a freemium game, and there are a lot of places for you to spend your money. First of all, is the freemium 'pay to play' counter. Every mission costs a certain amount of credit to play, and while this credit tops itself up over time, as you progress through the missions you'll find that you have to either put the game away while the credit resets, or pay up to buy credit to play. A mobile game, in my opinion, should always be ready to play. You also have to upgrade your characters as you play so they have more armour, health, and better weapons. This is done through cards you can occasionally find in the game, but more likely in 'booster packs', where you can buy a random selection of cards with the gold credits. And once you have a card you can apply to upgrade a hero character, you need to spend more gold credits. And as you go through the game, the cards you need are more expensive, the upgrade cost is even higher, and I can see right now at the start of the game just how restrictive and demanding this process could be. Speaking of restrictive practices... It's also limited to handsets with more than 512 MB, which seems a crazy call. This is, after all, just a bunch of animations on top of a pick a target game, Why you need all that RAM just to move the graphics around the screen I have no idea - it smacks of filling up the space because the programmers could. I can't see anything in the game that would merit a RAM restriction - there is nothing complex at all here. Star Wars Assault Team has left me feeling cold. 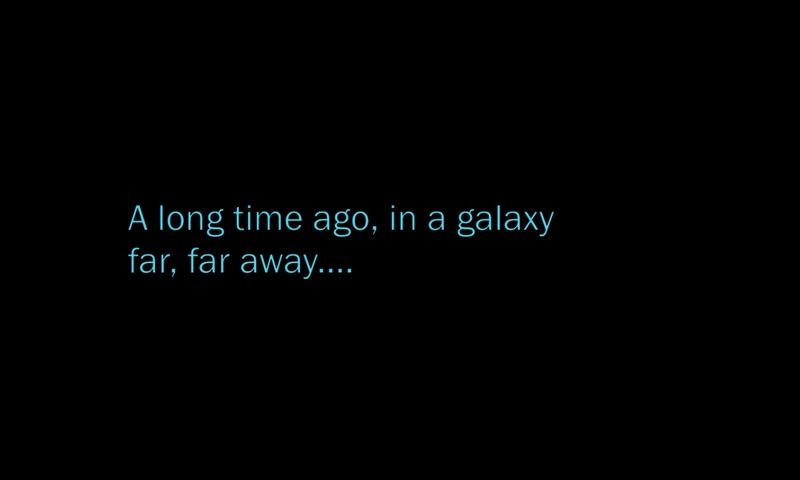 There is the start of a good game in here, but it needed far more thought and planning at the design stage of the game, it needed more than the standard Star Wars graphics slapped over it, and it needed smart programming to be available over all the Windows Phone 8 range, rather than just the higher end handsets. Take away the brand name, and there's nothing here. Add the brand name, and more people will discover that there's nothing here. "This isn't the game you are looking for, you can go about your business, move along."